Wildfires are known for striking in hot, dry regions of the planet, but a huge fire is currently raging across the icy, cold surface of Greenland, one of the most northernmost countries in the world. It’s not clear what started the fire, but it seems to be made up of multiple blazes happening in the tundra on the coast of the country. Just before the fires started, relatively high temperatures of 12 degrees Celsius (53 degrees Fahrenheit) were recorded in the area. Experts think climate change could be to blame – that dead plant matter usually encased in permafrost is catching fire as the frost melts due to warming temperatures. Scientists have spotted much more wildfire activity in Greenland so far during 2017 than in any other previous year on record. 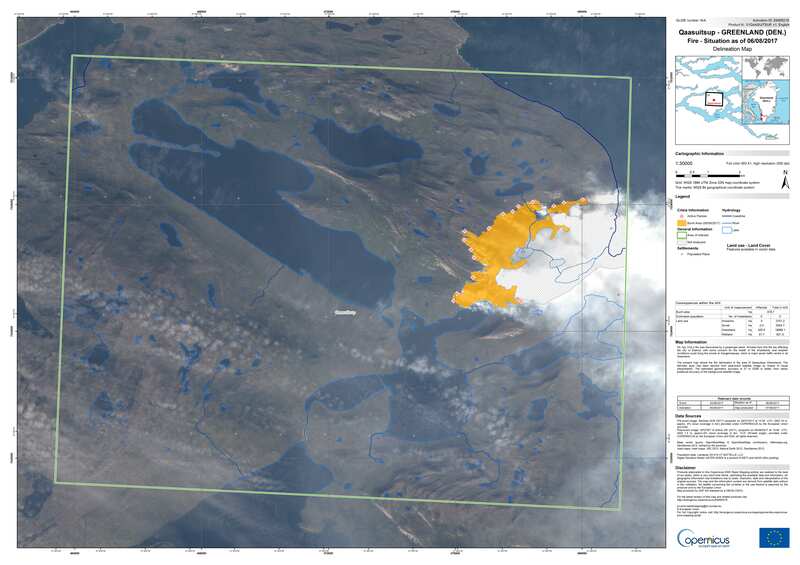 The wildfire was first detected by NASA satellites on the 31st of July, some 150 kilometres (93 miles) northeast of the town of Sisimiut. The most recent datasuggests several thousand acres of land have been affected. If you’ve got an image of a country covered by ice, that’s absolutely right – most of Greenland is covered with glaciers up to 3 kilometres (1.86 miles miles) thick – but around the edges of the coasts the terrain is covered with low-lying, sturdy vegetation. Lightning could’ve been the spark that caused the latest wildfire, according to Lhermitte, although he says it’s difficult to be sure. With no significant rainfall on the way, it could be a while before the fire peters out, New Scientist reports. Unsurprisingly, hunting and hiking activities have been affected, but the fire is also damaging reindeer grazing grounds. And it’s not just the fire that’s the problem either – as well as further thawing the areas immediately around them, wildfires release soot and char into the atmosphere that melt snow and ice when they land. Data on fires in the region has only been collected since 2000, but calculations run by Lhermitte, and based on NASA satellite readings, show wildfires have already affected twice as much of Greenland as they did last year – at least in terms of surface area covered by fire and the resulting cloud spotted by satellite. In fact significantly increased wildfire activity has been recorded since 2014. Forest fires elsewhere around the Arctic circle are also on the increase: a 2013 study showed the rate of wildfires is at its highest in the last 10,000 years. Rising temperatures and drier conditions are thought to be the primary causes. Based on the most recent data we have, the Arctic is warming faster than anywhere else on Earth, with the onset of spring melting in Greenland in 2016 the second earliest it’s been records began 38 years ago. And as the new wildfires show, the impacts go beyond melting ice and rising sea levels. Polar scientist Marco Tedesco, from Columbia University, told EnergyDesk, an affiliate of Greenpeace, that the only glimmer of good news is that we’ve got better sensors and technology than ever before for tracking these fires and the changing Arctic conditions. “This hopefully will help us to shed some light on this very interesting event,” he says.